When planning and running events, there’s a ladder of excellence you must climb, and orchestrating flawless logistics is just the first step on that ladder. The core of designing events is providing tailor-made experiences that will foster genuine interaction and bonding among attendees. As Joe Goldblatt, professor at Queen Margaret University in Edinburgh, argues, the very nature of events is empowering people to build meaningful connections through shared activities and interests. That’s why events professionals should understand and harness the true potential of a good seating layout. Apart from enhancing the attendee experience, the way you map the site and accommodate the venue will greatly affect how your guests interact with each other. An efficient design layout will take into consideration aspects such ensuring prime location of seats (or tables), configuring the attendees’ proximity to each other and VIP guests, and the strategic positioning of the relevant influencers. To help you navigate all these aspects, we put together a series of recommendations on how to design an event seating layout that will ensure guest interaction. Depending on your goals and the type of attendees, you must come up with a specific seating layout for your event. Do you want for the attendees to interact with the industry influencers while sharing their opinions and expertise? Or do you want them to bond during co-creative activities? What exactly do you expect from the attendee interaction, and what is the layout you want to follow? From open spaces and roundtables to fishbowls and pro-action cafes, there are multiple interaction formats for events. If you want to help people connect, you can place them in small discussion groups and, during the event, ask them to interact. If you want the participants to mingle at some point during the event, make sure your seating layout supports that environment. Finally, if you want to foster collaboration and informal conversations, you can always go for a semicircle or half-moon layout. The only thing you must keep in mind is the intention you’re pursuing and if you’ll be able to reach it through the interaction format you’ve chosen for your event. If you choose to go with roundtables or a half-moon layout, you must know exactly how many attendees you can seat per table. 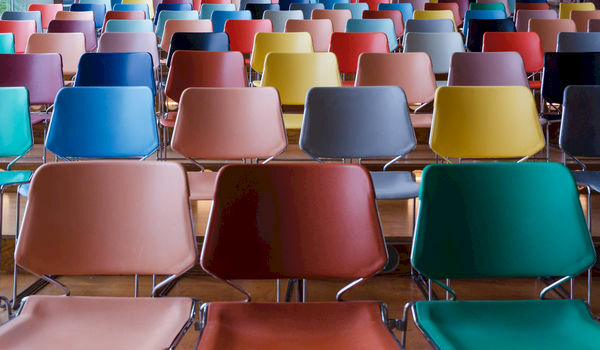 In their research paper "Meeting Analysis: Findings from Research and Practice", authors Nicholas C. Romano, Jr. and Jay F. Nunamaker, Jr. studied the outcomes of different seating formats. According to the researchers, the number of people per table has a big influence on how well they interact with each other. For example, if you want attendees to connect through problem-solving or decision-making skills (using different games during the event), seat no more than five guests at each table. On the other hand, if you want to foster engagement through problem identification skills (through challenges, for example), it’s advisable to have bigger tables for about ten people. An important aspect to consider when choosing a roundtable format for your event is deciding who sits next to whom. For a better interaction, it’s recommended to mix your attendees up a bit and try to sit people who don’t already know each other at the same tables. You can do this before the event by assigning specific tables and seat numbers, or during the event by encouraging people to get up and change seats. Obviously, to have more control over the interaction format, you should take the initiative and decide the groups yourself as opposed to the attendees deciding to seat next to people they already know. To get people interact with each other, the seating layout is not enough. Think about providing a series of engaging activities. This will make everyone feel more comfortable and break the ice. Design a series of co-creative dynamics and help people bond while doing something together. From funny trivia (“Name that song,” for example) and wellness activities (such as group meditations) to crafts and improvised theatre, there’s an endless amount of fun and creative ways to increase attendee interaction. Even if you provide the perfect interaction format, people still may feel a little bit shy or reserved. After all, networking and interacting at events can be very stressful for some people. Sure, everyone loves engaging in fun activities, but when it comes to more personal communication, some people might clam up. To help them avoid these tense moments, you must cultivate the verbal interaction by giving them enough reasons to speak. For example, you could work with the event moderator to come up with a series of questions and encourage people talk to the person next to them or to everyone at the table. The moderator could ask the attendees what their expectations are for the event and what motivated them to attend, what they feel are they biggest challenges in the industry these days, etc. The secret to a successful seating layout is not just about the venue design. Although the interaction formats are crucial in engaging your guests, it’s also important to understand a series of subtleties that will make this happen. Make sure you have clear goals and know on what basis you want for the attendees to interact. Be very careful in identifying the expectations of your guests and positioning the key influencers at the tables. Apart from that, don’t expect for the seating layout to work by itself. You need to lift up attendees’ spirits through co-creative activities and communication exercises that will get everyone actively engaged.